My Brother ruffle foot, installed on my Brother NS10. I've made a few petticoats in the past year, plus a layered circle skirt with four layers, each requiring between 6-8m of ruffles along the hem (I tell you what, never again! ), so I feel like I'm getting to be a bit of a pro with the old ruffle foot. Something I've noticed with petticoat and general gathering tutorials is that they mostly deal with gathering using the bobbin-thread method and rarely discuss how to achieve a similar effect with a gathering foot. There's nothing wrong with the bobbin-thread method, other than the fact that I lack the patience to hand-gather the amount of fabric required to make a petticoat - or the 30-odd metres of ruffling trim for that darned multi-layered skirt! It was actually halfway through the first layer of ruffles that I decided there was no way on Earth that I would be gathering the whole lot by hand, and went out and bought myself $75 worth of gathering foot. It wasn't cheap, but it was worth every cent! 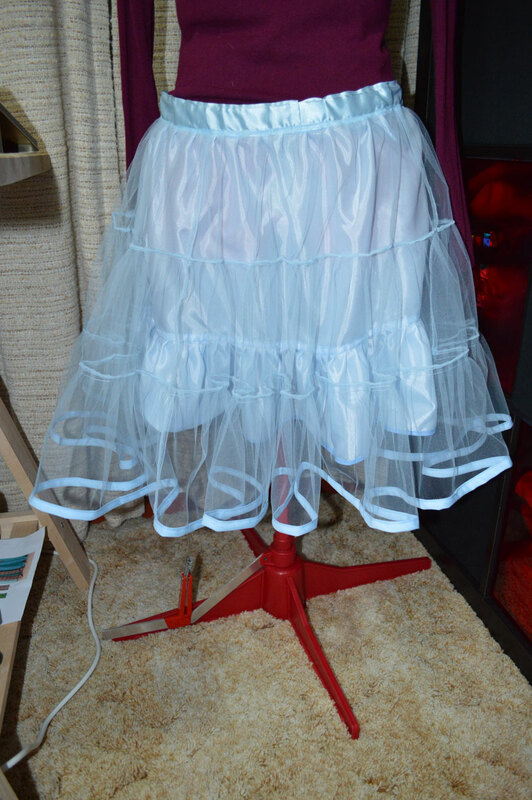 My most recent petticoat - I call it "princess blue" - made for my best friend. For a petticoat, you'll want a more scientific method, and you're probably going to want to gather at a 2:1 ratio (original to ruffled fabric length). The question is, how do you do that? The exact settings will depend on your ruffle foot. On my Brother ruffle/gathering foot, I like to set the stitch length to 3, the ruffle frequency to 6 (i.e. one ruffle every 6 stitches) and the ruffle depth to 8 (the maximum). By having a nice deep ruffle depth and 6 stitches between ruffles, the ruffles are more secure because there's more fabric caught in each ruffle and more stitches holding each ruffle in place. If I wanted a really secure ruffle, I would halve my stitch length and increase the ruffle frequency to 12, but that would also take a long time, so I feel that 6 is a nice compromise. One thing to note is that slippery fabrics will need more frequent stitches (i.e. a shorter stitch length) in order to hold the ruffles in place. The same goes for thin fabrics such as lining or tulle. The other reason I use a stitch length of 3 is because that's what's required for my foot to produce a 2:1 ratio, but if you wanted a tighter (more ruffly ruffle) ruffle, you would decrease the stitch length. Likewise, if you wanted a softer, less frequent ruffle, you would increase the stitch length. You can also achieve similar results by manipulating the settings on the foot itself, using the ruffle depth and frequency settings. The method you use will depend on what effect you're looking for. I recommend getting a long scrap of fabric similar to the fabric you'll be using and experimenting until you find the result you're looking for. To confirm if your settings are correct, get two pieces of fabric, preferably in the ratio you want the end product to be (i.e. for a 2:1 ratio, have one piece twice as long as the other piece). If you can, try to use selvedge scraps, because you'll be a little bit rough with these poor fabric scraps. Next, sew them together along the short edge. You'll notice on mine (Figure 1) that the shorter one is actually longer than half the length of the longer piece, but I've marked where it should have finished with a blue pen. I'm not sure if all ruffle/gathering feet work like this, but with mine, you need to insert the fabric to be ruffled between the two layers of the foot. If you're not getting the results you were expecting, this might be the problem. Check the instructions for your foot to make sure you're inserting the fabric in the correct location. Once you've ruffled your way to the seam, lift your needle up and pull the fabric out (check your ruffle foot instructions for how to do this without damaging the foot). Fold the long, ruffled side of the fabric over so the top edge is against the top edge of the shorter piece. See how mine (Figure 3) is slightly longer? That means I need to shorten the stitch length to make the ruffles closer together, which in turn shortens the finished length. In this case, I started with a stitch length of 4 and decreased it gradually until I got the ratio I wanted (which ended up being 3). I hope that's helped anyone who is new to using their ruffle foot and is scared to experiment. Never be scared to experiment! Keep your scraps of fabric and use them to learn new things. Just make sure to read the instructions that come with your equipment and go slowly! Let me know if you have any tips on using a ruffle foot!